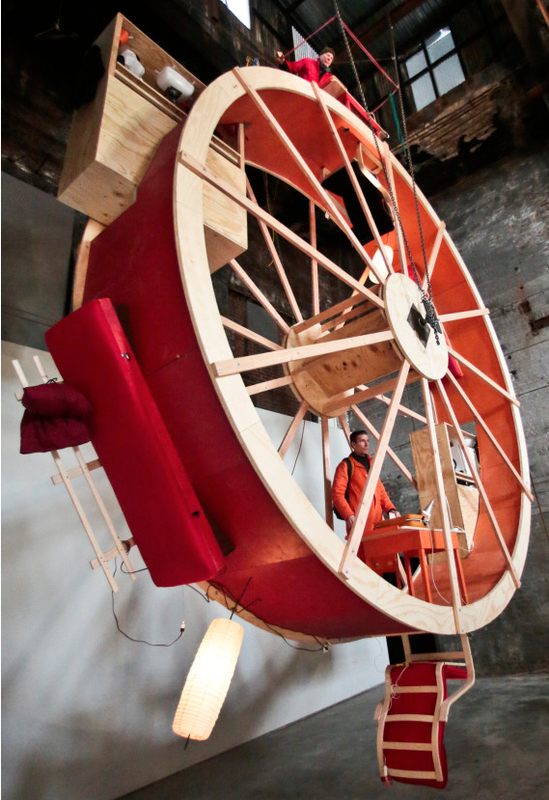 Peformance artists Ward Shelley and Alex Schweder will live for 10 days in a giant constructed hamster wheel in a piece entitled In Orbit. The piece can be seen at The Boiler, the performance space at the Pierogi Gallery in Brooklyn. The men will constantly need to be 180 degrees from each other and will need to carefully coordinate their movements in order to stay on the wheel. They must move in opposition directions and when one stops, so must the other or else they face falling from the 25ft high wheel. The wheel is equipped with beds, chairs, a desk, fridge, kitchen and even a chemical toilet (complete with private screen.) The two artists will be supported by safety harnesses during the 10 day stint.